This post is written by my 14-year-old daughter, Kylin.... Opinions are 100% her own. After watching the trailer for the animated kid’s film called “Epic”, I was really excited to watch it. Not only because the voices were done by well-known actors like Amanda Seyfried, Josh Hutcherson, Colin Farrel, and Beyoncé, but also because - unlike some of the other children’s films, - it didn’t focus on crude humor and inappropriate language and, instead, focused on more on family relationships and good friendships. “Epic” is a movie about a teenage girl called M.K. (voice by Amanda Seyfried), who returns to her father’s house only to discover that he is still caught up in trying to discover this tiny civilization that he believes is in the neighboring forest. Of course M.K. doesn’t believe him, but while taking a walk in the forest, she discovers something that changes her mind. Queen Tara (Beyoncé), is injured while trying to deliver the Heart of the Forest to its rightful place. When the dying queen sees M.K., she shrinks her down and gives her the responsibility of delivering the Heart of the Forest. M.K. doesn’t even know where to start, but luckily she has the help of Ronin (Colin Farell), a veteran Leaf Warrior, Nod (Josh Hutcherson), a young maverick, and two silly mollusks. They’re journey won’t be easy though. This movie is a fantastic movie for all ages. I’m 14, and I would be confident in it being an enjoyable movie to watch with a group of friends. My whole family sat down to watch it, and there wasn’t a boring moment for any of us. I have noticed in most family movies there has been name calling, crude humor, suggestive scenes, and it just wasn’t a very entertaining movie. But I very much enjoyed being able to watch a movie were you didn’t have to have one of the younger ones hear a word they weren’t supposed to hear, or have them look away during a frightening scene. It was full of heartwarming scenes, as well as family friendly humor and age appropriate action. It is definitely a movie I will be suggesting to everyone I know! 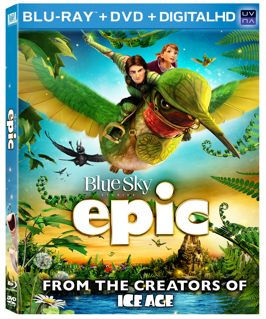 Epic arrives on DVD and Blu-ray August 20th. If you want to catch the excitement now, The EPIC COLORING & STORYBOOK BUILDER app is available today for iOS, ANDROID and AMAZON. 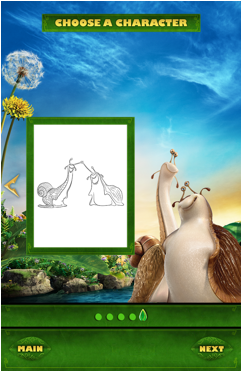 The app offers 5 characters and 3 backgrounds to consumers of their favorite Epic characters. Once one has purchased the Epic Blu-ray or DVD (on Aug. 20) – they will find a code in the packaging that allows them to unlock an additional 14 characters and 7 backgrounds -- giving a total of 19 characters and 10 backgrounds to help create up to 190 different coloring pages for kids and their families! Additionally, users can enter the “Storybook” builder mode to bring their custom creations to life by selecting their favorite images, recording dialogue, writing the story, and sharing on the big screen! Pre-order the Epic movie at Amazon.com!